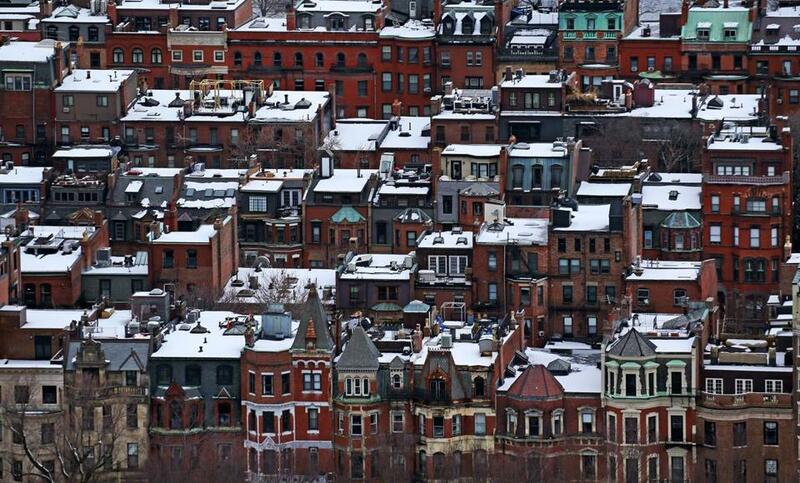 Snow covered roofs in the Back Bay section of Boston last week. Editor’s note: The National Weather Service issued an updated forecast Monday morning. For details, click here. As much as 18 inches of snow could fall in Greater Boston Monday night and Tuesday, threatening more widespread power outages in the third nor’easter to strike the region in less than two weeks. Snow is expected to start falling in the city by 11 p.m. Monday and continue throughout Tuesday, according to the National Weather Service. Blizzard conditions are possible throughout Eastern Massachusetts, and forecasters said they’re concerned about heavy, wet snow accumulating in the southeastern region and parts of Cape Cod, which could lead to downed limbs and power lines, according to the weather service. “There will probably be more power outages,” said Bill Simpson, a meteorologist with the National Weather Service. A winter storm watch has been issued for the entire state, along with a high wind watch for the Cape and the coast. The Cape could see wind gusts of 50 miles per hour. The wintry conditions threaten to be hazardous for travelers Tuesday. “This will be a double-barrel commute nightmare,” Simpson said. Simpson did warn that the forecast is early as the storm is expected to start forming Sunday night off the coast of Florida and Georgia and the snow prediction could change. But Sunday’s forecast calls for the eastern part of the state to get up to 18 inches of snow, while Central Massachusetts could get up to a foot. Western portions of the state are expected to get 6 to 10 inches, Simpson said. As of 10:45 p.m. Sunday, about 192 homes and businesses remained in the dark, mostly in Suffolk, Middlesex, Essex, and Norfolk counties, according to the Massachusetts Emergency Management Agency. About 142 of the outages were Eversource customers while about 43 were National Grid. Michael Durand, a spokesman for Eversource, said crews were still working to restore power for the remaining customers, and the company will remain in emergency preparedness mode ahead of Tuesday’s storm. “As is often the case after storms like this one, we’re still working to repair some lingering damage to a small number of customers, as well as residual damage that is coming in today,” Durand said. Molly Gilson, a spokeswoman for National Grid, said on Sunday the company expected to have nearly all customers back online before midnight, except for a few in Bristol County. But in Boxford, which still had 11 percent of its residents without power Sunday — more than any other town — Board of Selectmen chairman Chuck Costello said residents are fed up with National Grid. “The devastation in Boxford was significantly more than what National Grid had reported, and the concern is that they’re unable to provide restoration crews in a timely fashion to the town,” Costello said. He said the company’s performance after an October storm was similarly poor, which led the town’s selectmen and town administrator to ask the attorney general’s office and state Department of Public Utilities to investigate its response and restoration practices. Gilson said in response that National Grid values its relationships with towns and cities and always welcomes feedback on their practices. She declined to comment further on the outages in Boxford. Becky Jones, who lives in Boxford, said she was without power from 1:30 a.m. Thursday until late Sunday afternoon. The family’s power came back on around 5:30 p.m. Sunday, she said. 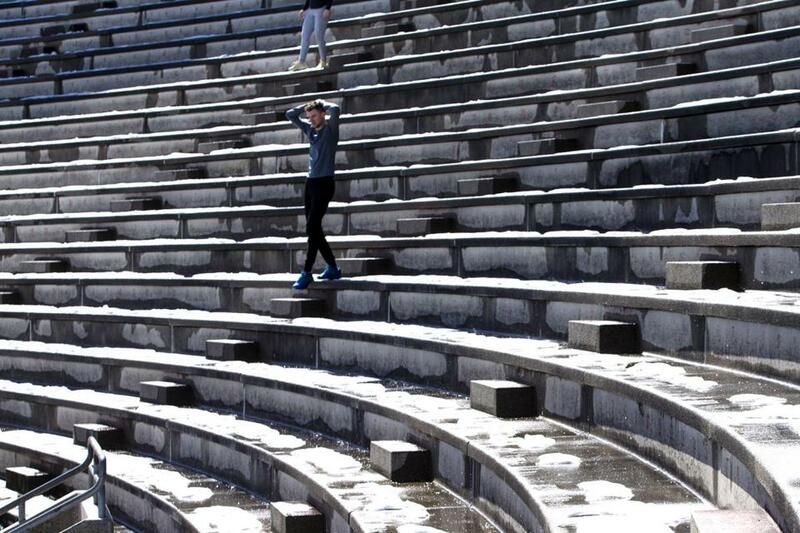 A man climbed steps at Harvard Stadium in Boston on Sunday, with the seats still holding snow from the last storm. Globe correspondent Andrew Grant contributed to this report. Dylan McGuinness can be reached at dylan.mcguinness@globe.com. Follow him on Twitter @DylMcGuinness.